This recipe comes from a friend, who adapted it from a caramel-rolls recipe he learned as a teenager. Prep the dough the evening before and let it rise overnight in the fridge. In the morning, give yourself a couple of hours to finish making the rolls. Make the dough: Scald the milk in a small saucepan. Stir in the butter until melted, then let cool until lukewarm. In a large bowl, mix together the flour, salt, and yeast. Pour in the milk/butter combo and stir to combine, then let the mixture rest for 10 minutes. Knead the dough for a minute or two; if the dough is super-sticky, add a little more flour. Let the dough rise at room temperature for two hours, or cover the bowl and refrigerate the dough for at least eight hours. When ready to prep the rolls, generously butter a 9-by-13-inch baking dish. Prep the rolls: On a lightly floured surface, roll the dough out into a rectangle about 14 by 16 inches. Make the corners as square as possible. Spread the dough liberally with the melted butter; be sure the butter covers the entire rectangle. Scatter the brown sugar in a thick, even coat across the buttered dough, then sprinkle the granulated sugar on top. Sprinkle a nice coat of ground cinnamon across the sugar; you should have enough so that the cinnamon is even across the rectangle of dough, but not so much that it obscures all the sugar. If using the raisins, scatter them evenly across the dough. Assemble the rolls: Roll up the dough rectangle into a log 14 inches long. Slice the log into eight equal pieces and place each piece spiral-side up in the buttered baking dish. You may need to slightly loosen and flatten the rolls a bit, so that they're spaced about half an inch apart. Preheat the oven to 150 degrees. Place a rimmed baking sheet on the bottom rack of the oven and pour about half a cup of boiling water into the sheet. Turn off the oven and place the pan of rolls onto the remaining oven rack, above the steaming baking sheet. Shut the oven door and leave the rolls to rise for about 30 minutes. Bake the rolls: When the rolls are puffy, remove them (and the watery baking sheet) from the oven. Preheat the oven to 350 degrees, then bake the rolls for 25 minutes, until the tops of the rolls are golden brown. Make the icing: While the rolls are baking, melt the tablespoon of butter in a small saucepan along with the tablespoon of milk. Turn off the heat, then whisk in powdered sugar, ⅓ cup at a time, until the mixture is thick and smooth, then whisk in the vanilla extract. Pour the icing over the hot rolls, and serve while the rolls are still warm. If you wish, replace a third to a half of the flour with whole-wheat pastry flour. 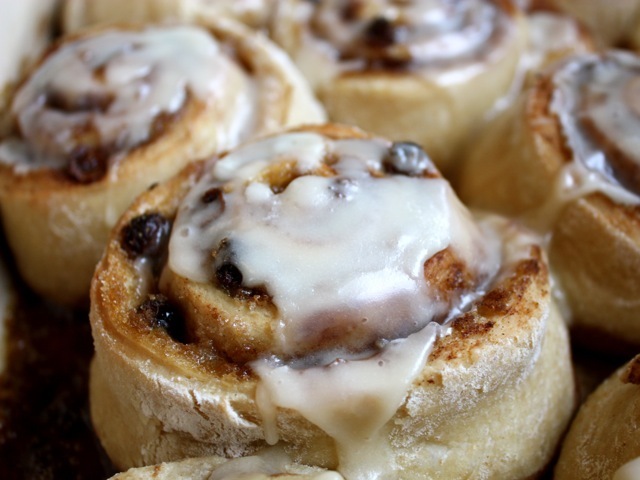 If you like your cinnamon rolls with copious amounts of frosting, just double the icing recipe.